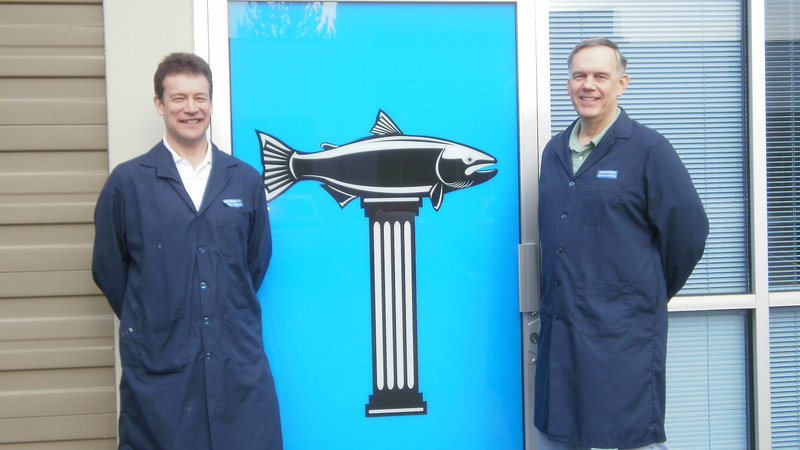 We are long-time practically-minded fish health and fish vaccine pioneers. HUGH MITCHELL, MS, DVM- is a veterinarian/biologist who has been working with fish diseases and fish vaccines in the field for over 20 years. He has consulted for fish hatcheries and farmers around the globe on a wide variety of fish health issues, including: “better people management for better fish health”. He pioneered vaccination mass-application injection techniques in North America in the late eighties. He has managed R&D, Technical Services, and Sales and Marketing Departments with two leading international fish vaccine companies. He has served on several professional and government committees working for increased access to fish health tools by fish farmers and stock enhancement facilities. He specializes in using and analyzing vaccines in the field under production conditions and will work with clients to ensure the most cost-effective vaccine solution. He is also an ardent advocate/activist of fish culture for sustainable seafood – both wild stock enhancement and private aquaculture. He is a lecturer on aquaculture medicine and fish vaccines at AQUAMED, a continuing education summer course for veterinarians and veterinary students out of Louisiana State U. He has a strong background in statistics and experimental design and a penchant for epidemiology (study of the movement of disease through populations) and clinical trials in production settings. TOM GOODRICH, PhD – received his BS in Medical Microbiology from Montana State University and his MS and PhD in Marine Microbiology from Oregon State University. As Assistant Laboratory Director of Wildlife Vaccines Inc., he pioneered the early development and improvement of immersion vaccines against enteric red mouth disease and vibriosis for use in salmonids. He also developed the first licensed injectable vaccine using an oil-base adjuvant against furunculosis. Later as the Laboratory Director of Biomed/Alpharma he developed the first multivalent Vibrio vaccine against coldwater vibriosis (Hitra disease) in combination with traditional Vibrio vaccine. He improved upon his earlier injectable oil-based adjuvant system which remains as the primary basis of all injectable fish vaccines on the market today. The improvements led to the development of a variety of multivalent bacterial and viral vaccines built upon the original furunculosis-vibriosis formulation. Most recently he has been involved in the development and registration of effective anti-viral and anti-rickettsial oral vaccines for fish in Chile. In addition to Research and Development, Fermentation Development, and Production of fish vaccines, he has handled registration and regulatory affairs in the United States (US Department of Agriculture) as well as in multiple countries (Norway, United Kingdom, Ireland, Denmark, Canada, and Chile).